Santa met many kids at the Christmas Extravaganza this past weekend in downtown Lakeview. One of Santa’s elves, who helped make all the toys in his workshop, was on hand as well. Santa’s helpers worked feverishly at Santa’s Workshop this past weekend. Terri Lamb, left, organizer of Santa’s Workshop, poses with Tiffany Grow, who has helped with the workshop for the past three years. The rain and ugly weather didn’t keep Santa and his elves from arriving at the 13th annual Lakeview Christmas Extravaganza. If fact, it was practically raining toys in Lakeview this past weekend. There were kids, toys and gifts everywhere you turned in Lakeview. But, of course, when you have Santa Claus, a parade, a Santa’s Workshop and a bunch of toys, you’re not going to have any trouble getting kids to show up, come rain or shine. The Christmas Extravaganza kicked off with a splash in downtown Lakeview starting off with Breakfast with Santa. After a brief ride in the Christmas parade Santa headed over to Osgood Bank where kids lined up to get their photos with him. The theme of this year’s event was Rudolph & the Village of Misfit Toys. Many great prizes and raffle baskets were given out such as bikes, tablets, TV’s, and games. The kids picked these prizes up and many other toys at the local firehouse just down the street from Osgood Bank. The big feature of the annual event was Santa’s Workshop where local school kids cashed in their Santa Bucks for gifts. Santa Bucks are earned by reading books either through the Indian Lake Elementary School or the the Lakeview Library. 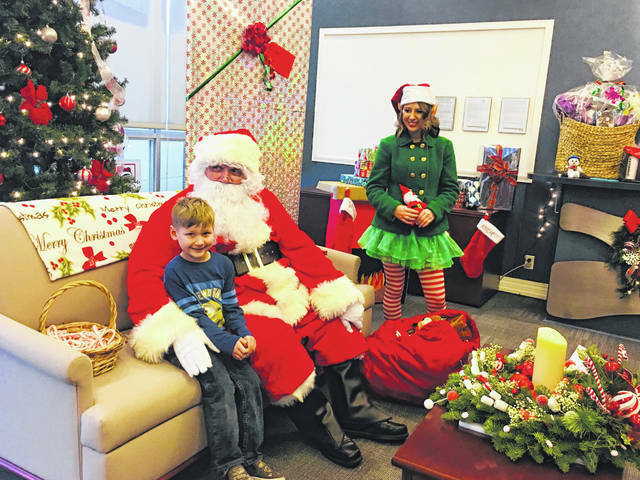 It was wall to wall kids at Santa’s Workshop inside the Young at Heart building in Lakeview. Santa’s Workshop was started in 2010 by Sylvia Wroten and her daughter Terri Lamb. 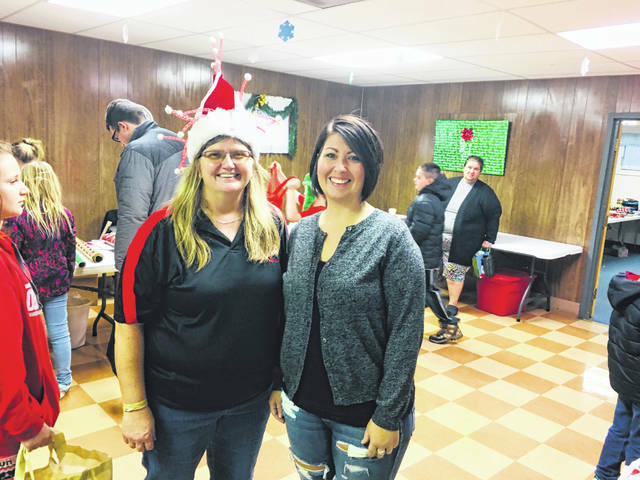 Santa’s Workshop is being carried on in her mom Sylvia’s memory by daughter Terri, who is the owner of “All Around Accounting.” It has taken the efforts of the whole community to make Santa’s workshop a success. “ I just want to thank everyone in the whole community who have been so supportive of this event year after year,” said Lamb. Donations of the food items were also accepted at the event by Osgood Bank for the United Christian Services Food Pantry. Bank representatives Sharon Stratton, Trena Hershberger, Karen Schmitmeyer, Angie Burton and many other employees and volunteers were on hand helping out with the event. 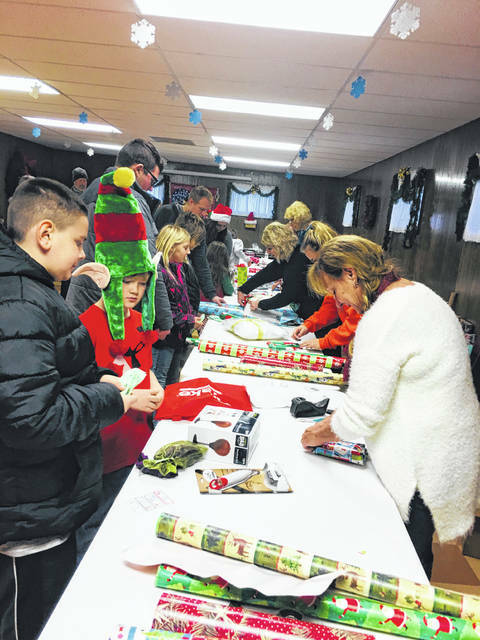 The Lakeview Christmas event is put on every year by the Lakeview Business Group.